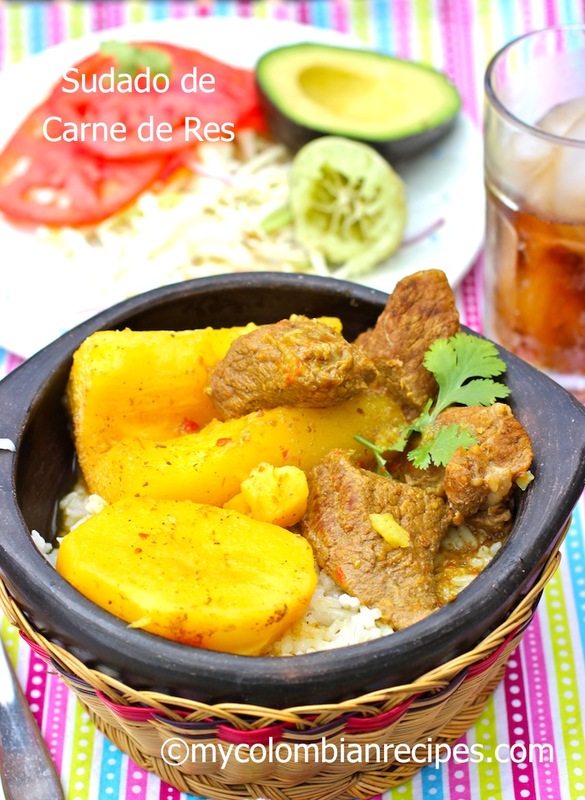 Sudado de Carne Res is a very popular dish in Colombia, is very easy to make and delicious over white rice with avocado on the side. I think every Colombian home makes a sudado dish a least once a week. Sudados can also be made with pork or chicken. 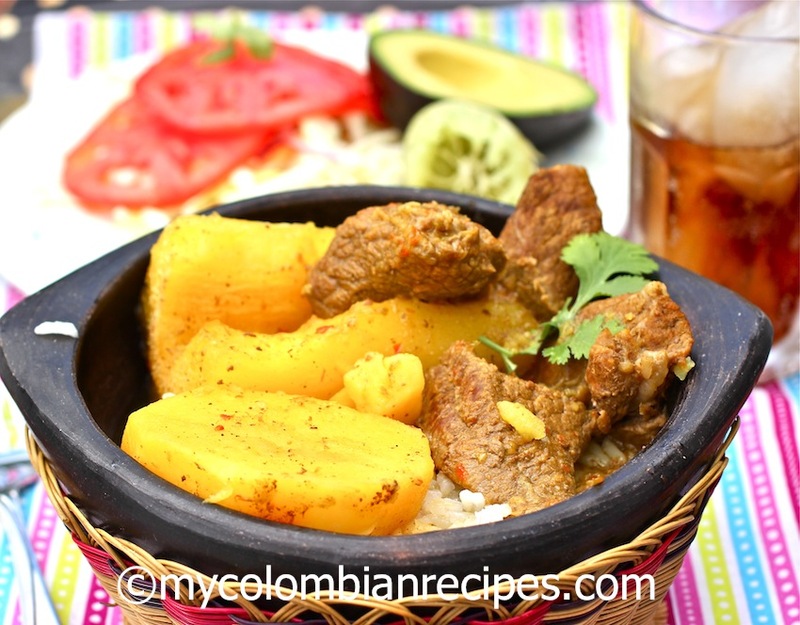 This Sudado de Carne Colombiano is a very comforting and filling dish and it is perfect for weeknight dinners. In a large pot, heat the vegetable oil over medium heat. Add the onion and red pepper and sauté until onions are translucent, about 3 minutes. Then add the tomatoes, garlic, salt and ground pepper and sauté for 5 more minutes. Add the beef, water, beef bouillon and cumin powder. Reduce the heat to medium low cover and cook for 45 to 50 minutes, stirring occasionally. 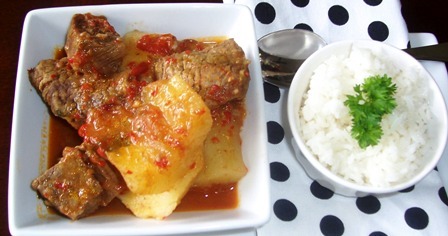 Add the potatoes, yuca and cilantro and cook for an additional 30 minutes or until the vegetables are tender. I love your recipes, want to go to Columbia ! Columbia huh? U mean Colombia. Great recipe! I was just browsing for stew recipes, since I’m feeling in a stew-y sort of mood, and this one winks at me! Thanks you for sharing it! Looks great. I never think serving a beef stew with avocado and rice. I like that! Oh man! Looks amazing! Rich and hearty…satisfies both your tummy and soul! Beef stew sounds wonderful! I love the cumin here and yuca! This fiery beef stew is so inviting. YUMMY! 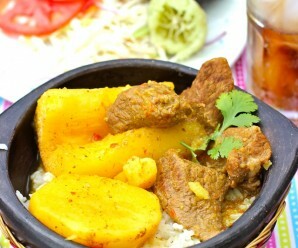 Mouth-watering when I saw the great combination of stewed beef and cooked rice. I do love the cumin powder, pepper, and fresh cilantro that you added in this recipe, the beef is fully flavored by this, terrific! Im on my third reciepe!! My family loves this food! Thank you I feel like I a chef!! And my food tastes like a pro chef made it; )!! I made this stew a couple of days ago and it was rich and delicious. It was even better the next day. Thank you. I made this stew for dinner last night….and I loooved. Thank you! WOW! this is a great recipe. I am no chef, but I could do this! Can this be made in a crockpot/slow cooker? If so, do I have to changr anything? Can the majority of your meals be cooked in the crockpot? Yes, but the cooking time will be 4 hours (high heat) or 8 (low heat) and 2 cups of water or beef stock . 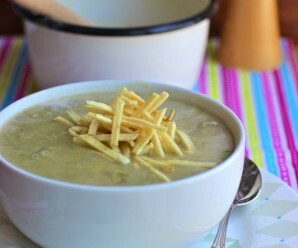 Para cocinar en el crockpot debo poner todo al mismo tiempo incluyendo yuca y papa por 8 horas en temperatura baja? Aimee, I don’t cook all my meals in the slow cooker, but some of them. My Abuela actually uses a pressure cooker more. It captures more flavor and speeds up the cooking time without compromising the meals. Delicious! I made this a couple nights ago and it turned out perfectly. Thank you so much for the recipe! 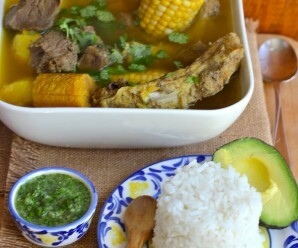 Colombia has the best food for lunch, always a stew or a hearty soup, lots of color, spices etc. Being the exact opposite of Brasil which uses no flavors or spices or peppers and is content with a diet of white things covered in salt or anything that is just salty with no color or flavor. Brasil likes to bbq meat but with no flavors or spices, just salt. A pizza is salt, cheeese, salt, chesse, salt. No tomato sauce, nothing. Salt is the only spice in Brasil. Very dissappointing. Colombia is way ahead, way more intelligent, etc etc. etc. im soo sorry Erica, how much of water you put for the Colombian sudado…? For this Sudado de Res: 3 cups of water. Love this recipe, it tasted just like moms cooking!!! I have made just about every sudado you have on here… This is the only website i use for recipes… Thank you very much!! I doubt it was autocorrect, but rather lack of knowledge. Thankfully people aren’t a lost cause and they’re usually open to learning IF someone is kind in teaching them without being negatively critical. At any rate, I quite often have to correct the spelling of Colombia for those who may never have had a reason to learn it. Know much about Nicaragua or Belize? How about Lichtenstein or it’s history? The point is that there are almost 200 counties in the world. There are hardly any experts among us. 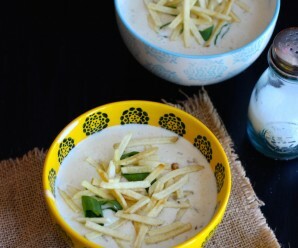 As for this recipe, I’m super excited to try it! It’ll be the first Colombian meal I’ll be preparing after being married to a Colombian for 8 years. Hey, don’t judge…I’m not the most experimental cook & quite frankly I’m a little nervous about searching for yuca in the store. I don’t even know if I’ll be able to find it here! Might have to go to Elizabeth, NJ for fresh! Wish me luck! Beef stew meat such as chuck roast or sirloin. I love your recipes but could you lease indicate which sort of onions you use in your recipes. I suppose you mean round onions when you do not specify spring onions. What part of Colombia are you from. 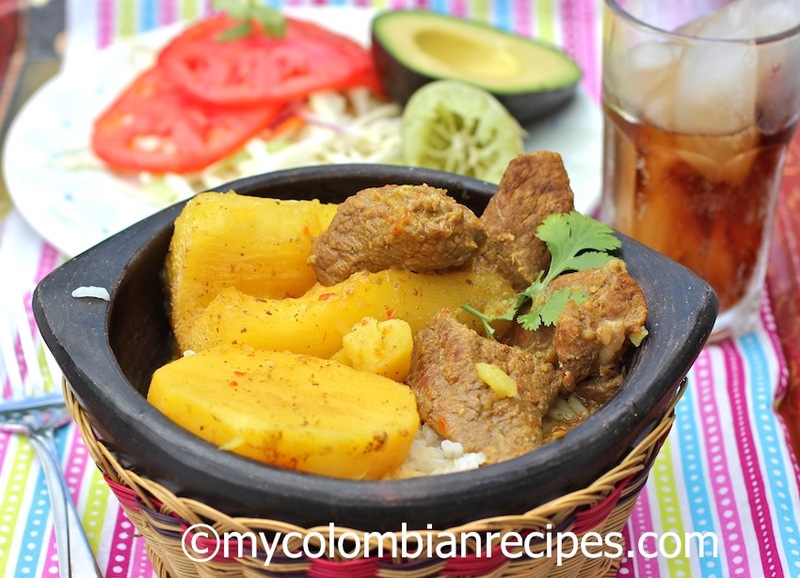 I love making your Colombian food. I’m Colombian-American and unfortunately my grandma died before she could teach me Colombia recipe of her own. I love your blog. Thank you!!! My family is part Colombian and now that we are apart, I get homesick for them and the food. I’ve been searching for these recipes for some time, and am so glad to have found your site and posts. This comfort food is delicious, and I look forward to trying your recipes as they appear to be so much like the ones served at home. My Colombian husband and I give this two thumbs up! Thank you for the excellent recipe. Thus far, every recipe I’ve made from your site tastes so traditional and delicious! Thank you so much for sharing!! You’re an awesome cook and now so am I.